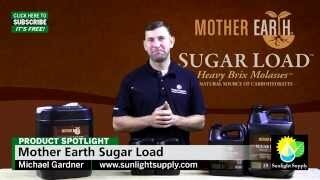 Mother Earth Sugar Load - Heavy Brix Molasses Mother Earth&reg; Sugar Load&trade; Heavy Brix Molasses&trade; is a rich source of carbohydrate for beneficial microorganisms, making it excellent for the use in compost tea stimulation. Watch the video to learn more! Mother Earth Growstone Mother Earth&reg; Growstone Chunky Growing Media is the perfect growing media for use in hydroponic growing systems as simple as manually irrigated containers or as advanced as automatically drip irrigated containers, Ebb-Flow systems and NFT tables. It replaces strip-mined materials like clay pebbles or stonewool, reducing environmental degradation. Mother Earth&reg; Growstone Chunky Growing Media is designed to allow for rapid moisture absorption and enhanced drainage and oxygenation. Mother Earth&reg; Growstone Coarse Soil Aerator is the ideal aeration component of soil mixes. Its highly porous aggregates act as air pockets significantly enhancing aeration and drainage of an sphagnum peat, coco coir or composted soil-based mix. As a result, it creates the ideal environment for your plants&#39; root systems and leads to healthy, thriving plants. Ideal for growing a wide variety of plants including herbs, flowering and woody ornamentals, vegetables, tropical, trees and scrubs. Mother Earth&reg; Growstone Coarse Soil Aerator is a sustainable alternative to perlite and other soil amendments used to improve texture and structure of soil or soilless mixes. 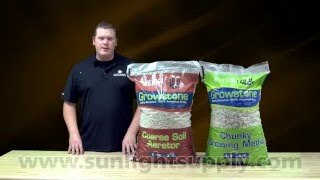 Mother Earth® Growstone Chunky Growing Media is the perfect growing media for use in hydroponic growing systems as simple as manually irrigated containers or as advanced as automatically drip irrigated containers, Ebb-Flow systems and NFT tables. It replaces strip-mined materials like clay pebbles or stonewool, reducing environmental degradation. Mother Earth® Growstone Chunky Growing Media is designed to allow for rapid moisture absorption and enhanced drainage and oxygenation. Mother Earth® Growstone Coarse Soil Aerator is the ideal aeration component of soil mixes. Its highly porous aggregates act as air pockets significantly enhancing aeration and drainage of an sphagnum peat, coco coir or composted soil-based mix. As a result, it creates the ideal environment for your plants' root systems and leads to healthy, thriving plants. Ideal for growing a wide variety of plants including herbs, flowering and woody ornamentals, vegetables, tropical, trees and scrubs. Mother Earth® Growstone Coarse Soil Aerator is a sustainable alternative to perlite and other soil amendments used to improve texture and structure of soil or soilless mixes. Mother Earth Meal Mix Mother Earth Meal Mix&reg; is a carefully selected blend of natural materials, formulated to provide a baseline media/soil amendment to build upon for the vegetative stage. Watch this video to learn more! Mother Earth Meal Mix® is a carefully selected blend of natural materials, formulated to provide a baseline media/soil amendment to build upon for the vegetative stage. Watch this video to learn more! 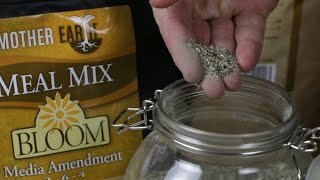 Mother Earth Meal Mix - How to Blend and Top Dress If you have never used dry organic amendments like Mother Earth Meal Mix, this video will walk you through some options and guidelines to get you started. 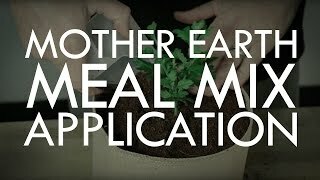 If you have never used dry organic amendments like Mother Earth Meal Mix, this video will walk you through some options and guidelines to get you started. Mother Earth Soils Video Learn more about our expertly crafted Mother Earth soils! 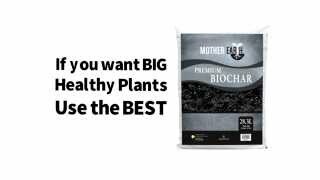 Mother Earth Premium BioChar Mother Earth&reg; BioChar is a fast and easy way to boost the performance of new soil and can improve the effectiveness of compost teas and mycorrhizial products. 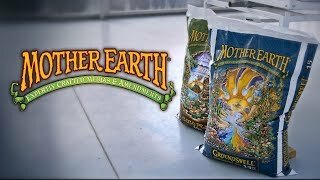 Watch this video to learn more about the features and benefits of Mother Earth&reg; BioChar! Mother Earth® BioChar is a fast and easy way to boost the performance of new soil and can improve the effectiveness of compost teas and mycorrhizial products. Watch this video to learn more about the features and benefits of Mother Earth® BioChar!